The Everything DiSC 363® for Leaders assessment helps leaders understand how others see them, using intuitive, easy-to-read visuals, rich cuts of data, and feedback breakdowns. 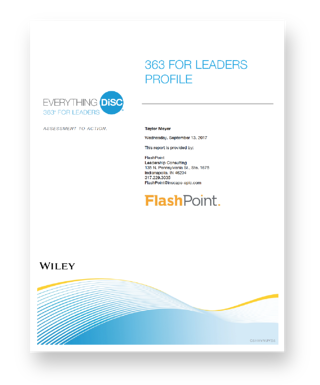 With a lot of 360s, the leader's response can be, “Now what?” Everything DiSC 363® for Leaders answers that question by giving leaders their next steps with three things they can focus on now. We recommend following Everything DiSC 363® for Leaders with coaching from one of our seasoned coaches to help leaders process and understand the feedback, identify development areas, and create an action.